An automatic swimming pool cleaner is absolutely the best piece of swimming pool equipment a pool owner can invest in. Manually cleaning a swimming pool is very time consuming and few pool owners enjoy this tedious task. An automatic swimming pool cleaner allows you to spend less time maintaining your swimming pool, and more time relaxing and enjoying your pool! There is a wide selection of automatic pool cleaners available for any budget, and every size In-Ground or Above-Ground swimming pool. There are three different types of automatic pool cleaners for In Ground pools and Above Ground pools, and they are classified by the way they collect debris and move around the pool. “Suction Side” automatic pool cleaners are connected to your pool skimmer and “Pressure Side” automatic pool cleaners connect to a return line fitting of your pool. “Robotic” pool cleaners work independently from your pool filtration system, and are powered by electricity. 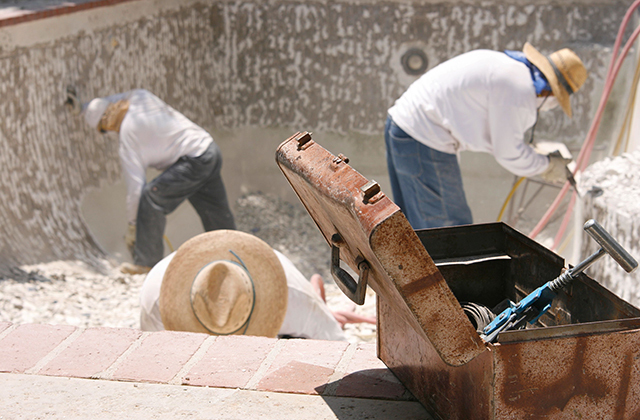 When you first installed your swimming pool, you probably never thought about the day when you would have to remove it, actually it is easy to get rid of it by using pool removal Sydney. Suction Side automatic pool cleaners use the suction power created by your filtration system to propel a pool cleaner around your swimming pool, and pick up debris from the pool floor. Suction side automatic pool cleaners are connected to the skimmer of the pool, and dirt and debris collected from the pool is deposited directly into your filtration system. Suction side automatic pool cleaners are very easy to connect to your swimming pool and to use. These pool cleaners may have an advantage over pressure side pool cleaners, because very little or no adjustments or additional parts are typically needed to adapt a suction side pool cleaner to your swimming pool. Examples of popular suction side automatic pool cleaners are the Hayward Pool Vac or Kreepy Krauly. Pressure Side automatic pool cleaners connect to the return line fitting in the wall of your swimming pool. Pressure side automatic pool cleaners use a powerful jet of water to move around your swimming pool, and a jet of water is used to draw debris up from the pool surface into a special filter bag connected to the pool cleaner. Pressure side pool cleaners may have an advantage over suction side cleaners because they are typically more powerful and can climb the walls of an inground swimming pool. Because pressure side automatic pool cleaners are connected to the return line fitting of the swimming pool, the pool skimmer is left open to draw dirty water and debris from the surface of the pool. These pool cleaners act as a roving return line, and help eliminate “dead spots” in the swimming pool which are not reached by the circulating action of the main filter system. These pool cleaners deposit debris into a special filter bag instead of inside your pool filter system. Some pressure side pool cleaners feature their own “booster pump”, which works independently from your main pool filter system to create the extra water pressure needed for these powerful cleaners. Examples of popular pressure side automatic pool cleaners are most Polaris and most Letro brand pool cleaners. Robotic automatic pool cleaners feature a built in filtration system, and operate independently from your main pool filter system. No cumbersome hoses or tedious adjustments are required. These self-contained automatic pool cleaners use on board electric motors to move around your pool and create the suction necessary to pick up debris from the pool surface. As these robotic pool cleaners move about cleaning the pool surface, they constantly circulate and filter your swimming pool water. A robotic pool cleaner will pick up debris from the pool floor, and can also climb the walls and steps of an inground swimming pool. These pool cleaners are designed to scrub the water line of the swimming pool, and regular use of a robotic swimming pool cleaner will eliminate the water line stain found on most outdoor pools. Robotic pool cleaners save a great deal of money in operating costs, because these pool cleaners do not require your pool pump and filtration system to be running for the pool cleaner to work. This also means you do not have to clean your filtration system after each use, using more electricity and losing chemically treated water through the filter backwash cycle. Robotic pool cleaners are available in many sizes and models designed for average size above ground swimming pools, up to the largest commercial facilities and water parks. Many robotic pool cleaners feature a hand held remote control, giving the pool owner complete control over the movements of the pool cleaner. This allows very quick and easy spot cleaning. The most common robotic swimming pool cleaner on the market today is the Aquabot pool cleaner. Please visit http://www.InTheSwim.com for a complete selection of inground and above ground pool cleaners.